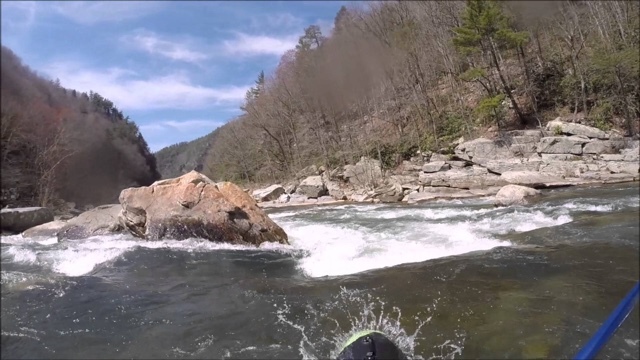 FOUR TIMES THE FUN ~ Wallacing The Nolichucky Gorge. 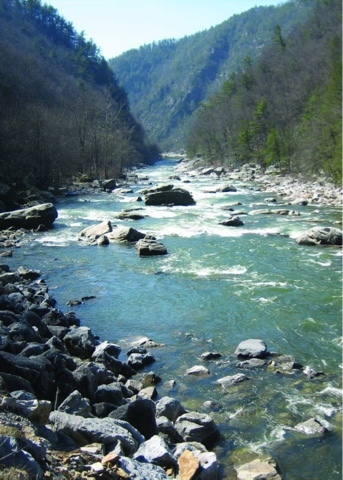 by Michael Potter,SE Correspondent | DBP MAGAZINE ONLINE The World's Best Free Whitewater Publication. The run I’m about to tell you about was just last Friday, June 10th. I had planned to take some classes and had posted request for an early weekend. I usually have no problem getting off a day here or there and actually think I have one of the most lenient jobs available. This weekend the boss gave me an extra day so I had nothing planned for that day… Oh, wait a minute, I have Dirtbag friends! I immediately started sending messages to all the friends I can find to get a third on the gorge. It’s Friday and real short notice so I’m having trouble finding an extra paddler. Finally a friend from Boone, NC jumps on the opportunity. At this point I’m stoked, and I send a message down south saying that we are on for the gorge at 1ish and I’ll call Matt Moses of USA RAFT to set the shuttle. One message to Matt and the shuttle is on and everything set. Off to bed I go with visions of happy dancing rapids in my head. Next morning I’m up early. I’ve never paddled with Nick Bonner before and couldn’t wait to see my friend from Georgia score his personal first descent (PFD) on the gorge with me. This is a happy day; I love the Nolichucky Gorge being in my backyard. Around 9am I get a text. “I can’t make it man. Work just called me in.” Jeezzzz! My third paddler gone! OK I got this. Shuttle is set, I think to myself, Nick wants the gorge, I love the gorge, the water is right, I can remember all the lines. OK, I’m good. No way am I backing down and disappointing him if he is willing to drive this far to paddle with me. I’ll keep searching for another paddler. At 1pm Nick shows up, right on time, and the shuttle is set. We are driven to the put-in, located in Poplar, NC. I’m calm now and stoked again. Time to paddle! I’m leading the gorge for the first time with a PFD at hand! The first drop that started this adventure. We start out for a beautiful day of 80+ degree gorge paddling. The water is a perfect temperature and running crystal clear. I’m in a boat that’s new to me that I’m demoing from a friend. It’s a LiquidLogic Flying Squirrel 85 and I have no idea how it’s going to perform. I test the reaction against the current as we start through the entrance rapid. I’m a little surprised at how well it’s handling. 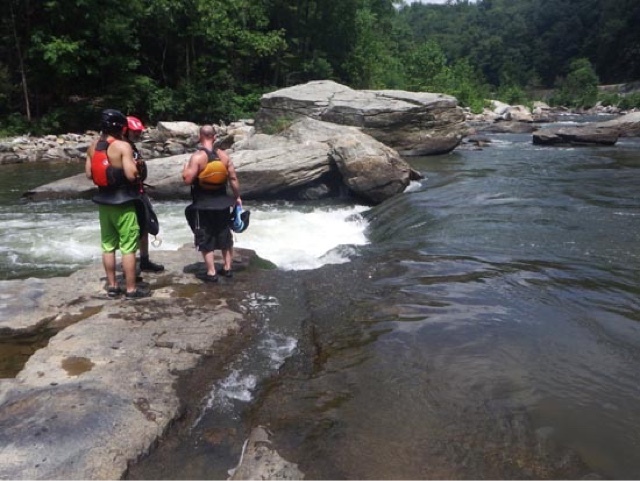 Explaining to Nick what to expect and what lines to run, we work our way to On The Rocks Rapids. Down On The Rocks we go. This boat is awesome! My confidence soars as I blast through Jaws, paddling downriver toward Quarter Mile. At Quarter Mile we stop and scout the far stretch of ledges and turns to come. 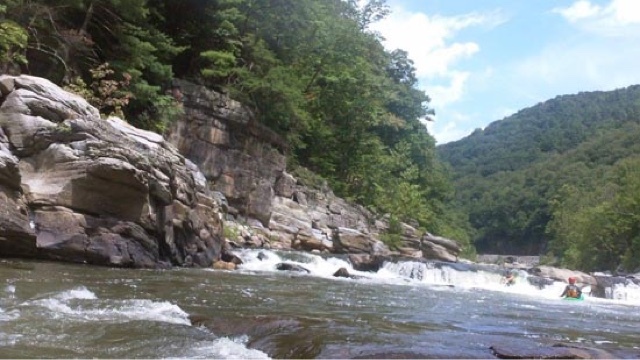 I explain that this is the one rapid you don’t want to swim, as your gear will end up at the end around the most respected place on the gorge, Murphy’s Ledge. The entrance to Quarter Mile is a ledge drop of about four feet, the river narrowing and immediately making a sharp left turn, followed by a nice slide of about fifteen feet. From there on it’s a series of small ledge drops, twisting and turning till it falls in a drop pool at Murphy’s Ledge. Usually there is a green tongue on the first drop on river left. Today however, there is no tongue, but rather a recirculating hole. Not a keeper, but nasty by all means. Nick picks a line on the right and plows in successfully, hitting the eddy on river right before the slide. I’ve never tried that line, and this boat is doing well. Humming? OK, here I go! I paddle upstream a few feet to get my ferry, plant my blade, and I’m off to bust the hole. As soon as I enter the hole on the right I disappear into the abyss. All suddenly turns white, and I feel myself surfacing fast. As I emerge, the cross current catches me and flips me over. Great, I’m upside down in the worst spot! Rapidly resurfacing in a leaning position, I stick my paddle out and immediately go to home position. My first attempt at the roll brings me barely above the surface of the water, not enough to grab a breath of air. Back to home position. My second attempt gets me a little further but still not enough. Two carped rolls and no air left for a third attempt. It’s time to exit stage right! I let go of the paddle with my right hand and pull the ripcord. I come to the surface again, and see where I’m headed. Not good! The current pulls me around the drop as I’m trying to point my feet downstream. A quick glance to my right reveals Nick sitting in the eddy watching helplessly. I know there is a large rock about midway down the drop, but everything’s happening so fast that I can’t remember if I’ve hit it or not. My adrenaline rush is at peak levels. I’m trying to swim away and out of the current but the force of water is much too strong and won’t let me out. As I hit the bottom of the fifteen footer, I take one quick breath, knowing I’m going under again. My mind is rushing to remember where the nearest safe haven is. Too late, and under the next wave I go, and out the other side. I open my eyes to get my bearings, and see Hungry Jack coming up fast. Jack is a small ledge pourover of three feet with a hydraulic behind it, also not a keeper, but it has sharp edges on it. Again I point my feet downstream and try to aim for the deepest part of the pourover. As I go through the largest gap in the ledge I lose my grip on the paddle and watch it slide through the rocks and out of sight. The current pushes me through the hole and out the other side. About ten feet downstream I get shoved into the rocks. I find my footing, and finally a safe resting place. I stand up and see Nick barrel into the eddy on river right. He asks if I’m good. I tell him I’m fine as I’m wading across the current to the eddy. The current is shallow but forceful, and finally manages to push me down again for a short three strokes to safety. After a quick assessment, I tell Nick that I last saw the paddle as I dropped the ledge and it was probably gone. Now I have a new dilemma… I’m up the creek without a paddle! Not only that, I don’t have a boat either! I explain to Nick that the hard part of the rapid was over and the rest is read and run to Murphy’s Ledge. We turn around… and watch as my kayak bounces through the drops, coming to rest… Yep. You guessed it. Right in the middle of the river on top of Murphy’s. The only place on the gorge that I worry about and it stops there! Can this get any better? Actually, it can. We decide to climb up the cliff for a better view. Now about thirty feet off the river basin, I am facing downstream with Nick beside me. I’m thinking hope is lost and I’m gonna have to paddle out of here with my hands. Nick turns slightly upstream and says the words I do NOT want to hear, “my paddle!” I turn to look, and sure enough here comes his red Werner floating over Murphy’s Ledge right below us. Murphys Ledge. My boat stuck on the rock in the middle at the highest point. I take off running like crazy, climbing up and down the boulder field trying to keep an eye on the paddle. It beats and bangs off the rocks for another eighth of a mile before coming to a slowdown where I feel good about swimming the river again. I swim over and capture the fleeing beast, then start walking the opposite side back to Nick while searching the banks and water for my own lost paddle. I hear Nick yell again, and look up to see my boat falling into the edge of the hole off the ledge. I keep walking towards Nick while watching my boat beater in the hole. Suddenly, it pops loose, starting slowly downstream. I throw Nick’s paddle at him and it lands ten feet or so off the bank. He jumps in for his own short swim to get his paddle, while I rest and wait on my boat to float by. As it comes by I once AGAIN jump into the current, grab the handle, and start swimming my boat full of water to the opposite side of the river, where I perch it on a rock for the empty process. Nick says “I’m going to get my boat. Your paddle is stuck in the second rock up.” He is already walking to Murphy’s Ledge. I empty and stabilize my boat on the rock and start my way up to find my paddle. I still don’t see it. I go a good bit upstream and jump in, aiming for the gap as my target. It wasn’t hard to hit. The current sweeps me straight to the slot. As I enter it, I quickly grab the paddle shaft, throwing it over the boulders into the calm pool on the other side. The current then pulls me straight through to my paddle with only inches to spare on either side of the rocks. I swim back to shore, very glad to finally collect all my gear after four of the most vigorous swims of my life. The rest of the trip was uneventful and just plain good class lll river running. This upcoming weekend I’m headed back to the river. Not to run, but to bombproof my roll. Did I mention that I hate swimming? EDITOR’S NOTE: Michael covers many local paddling events in the Southeast for DBP MAGAZINE ONLINE. We’re stoked he lived to tell this story and continue his good work! Wallace on!